Several developments have happened so far this week in the poultry department. 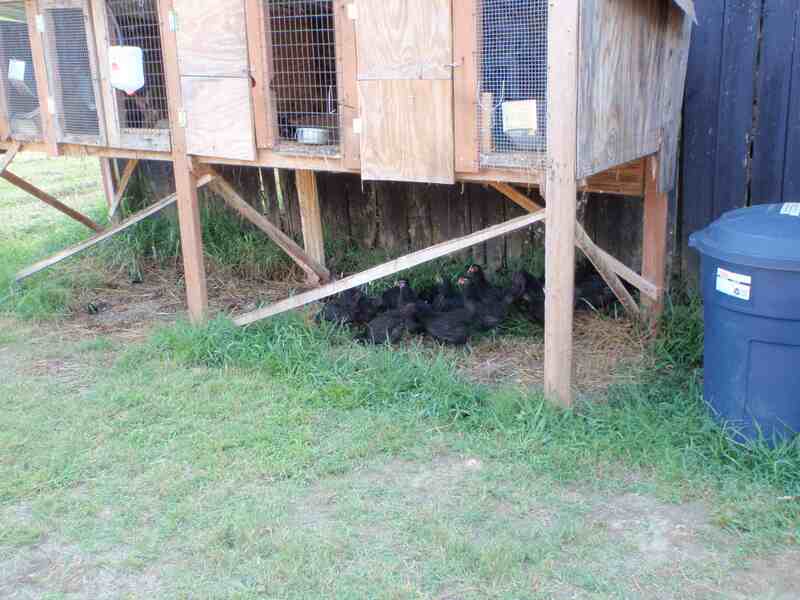 First, the Black Australorp laying hens have discovered the wonderful world of rabbit manure! We put the chickens near the rabbits deliberately so that we could add carbon (wood chips, straw, whatever) to the rabbit manure and the chicken could scratch through it looking for fly larvae and such, thus making compost for us and eliminating the flies from the rabbit area while getting cheap protein for the laying hens. Sounds great in theory, right? What we’ve been lacking so far is chicken cooperation. 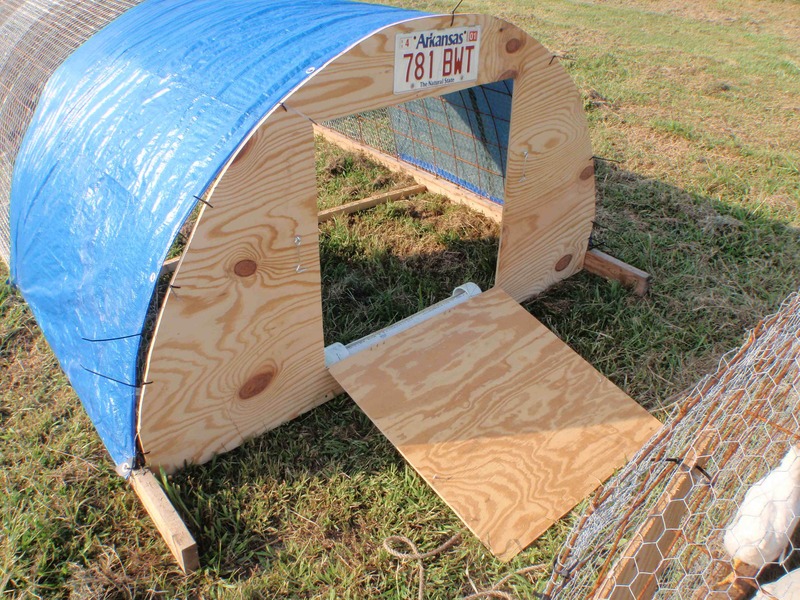 All of the poultry has been free-ranging for the last week or so, and the chickens have steadfastly refused to venture underneath the rabbit pens. 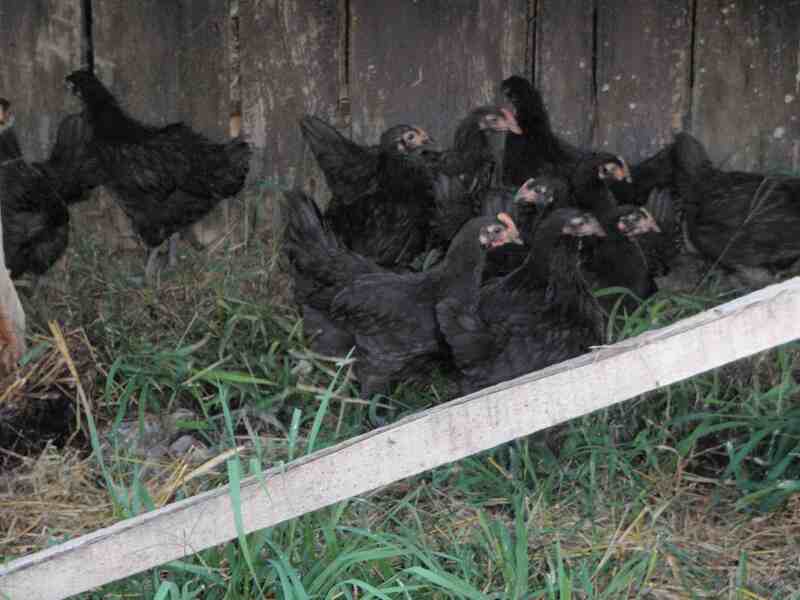 The laying hens finally discovered all of the goodies hiding in the rabbit manure. Here the ladies are scratching through the manure and grabbing up all of the fly larvae. Over in the Meat Chicken Division, we built Chicken Scooter 2.0 and moved the broilers into it to test out the new design and so I could modify Chicken Scooter 1.0 and add the new features. In the second generation, I made a feeder out of PVC pipe and attached it to the frame. No more taking the feed trough out in order to move the pen every day! The major design changes were to the ends of the scooter. Each end is now fully formed by plywood. At other farms that use this type of method, the weather tends to come from only one direction. We’re in a valley with hills on the eastern, western, and northern sides. That makes our winds swirl around and the wind and rain can come from either east or west, hence the plywood on both sides. The most convenient new feature though is the door is now right above the feeder on the covered end of the scooter. For Chicken Scooter 1.0, I wasn’t thinking about efficiency as much as I should have and made a design where I had to crawl into the scooter to grab the food trough on the far end, where I had to put it so it wouldn’t get wet. While I was doing that, some of the chickens invariably escaped and I would have to round them up and return them to the scooter. All this work because my brain wasn’t on the first time. Hopefully, lesson learned. Here’s some pictures of the newest chicken scooter. As you can see, the design is still the same size and almost everything is the same, save the ends and the door! As you can see, the designs are identical except for the ends. Here is the major change. A door on the same end as the feed trough, and the feed trough screwed to the frame. Finally, the broilers now have a date with the processor. Eventually we want to do this step here at the ranch for many reasons (less stress on the birds, no gas used driving them to Bowling Green, $2.85 less expense per bird), but until we figure out all of the legal mumbo jumbo surrounding turning animals into food we are going to have to allow someone else to process our birds. We chose SS Enterprises (http://aboutssenterprises.com) because they are relatively close to us, are family-owned and operated, and certified organic. So on August 23rd at 7:30 am, the broilers and I will be pulling into Bowling Green. Sometime after that, I will be leaving Bowling Green will several ice chests. Any readers in the area, we will have chicken for sale! Lindsey has created a new recipe for Braised Kentucky Bourbon Rabbit. I can’t vouch for the recipe. I’ve never eaten it. Neither has Lindsey. Lindsey hasn’t even eaten rabbit. But she should – it’s really good and really good for you! 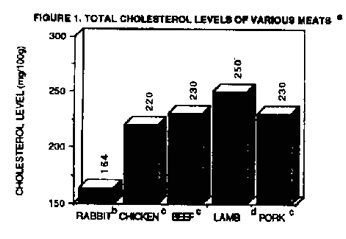 Rabbit meat is low in cholesterol – much lower than chicken, beef, lamb, and pork. It is also very low in fat, and most of the fat that it does have is of the unsaturated type. Despite this, rabbit meat has the highest percentage of protein. The meat also has fewer calories per pound than chicken, beef, pork, or lamb. Basically rabbit meat is about the healthiest meat you can eat. And it’s all white meat! Rabbits are also the ultimate in sustainability. You can produce 320 pounds of rabbit meat in a year starting from one pair of breeding rabbits. That’s more meat than a breeding pair of cattle can produce in a year, and the rabbits require far less of a footprint in terms of land, water, and food in order to produce the meat. As more and more humans take up more and more of the space on the planet, meat animals able to be productive on small footprints will become more and more important. Daniel Salatin has been raising meat rabbits at Polyface Farms for over 20 years now. He claims that they could sell 300 rabbits per week if he could produce that many, so there’s no shortage of a market in their area at least. We want to market our rabbits to the restaurants in Louisville, Lexington, Nashville, and Cincinnati. 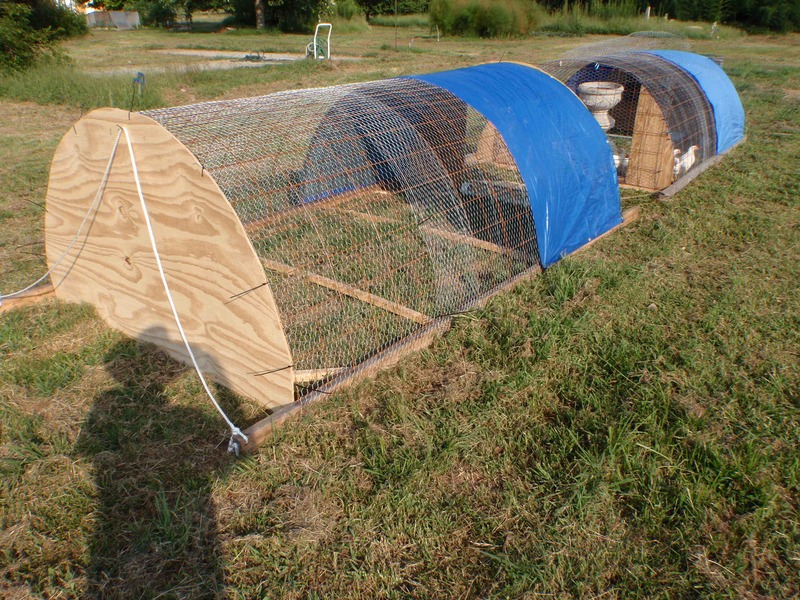 We plan to follow the Salatin model of raising our rabbits on pasture in the spring, summer, and fall and then bringing them into a hoop house or barn in the winter. 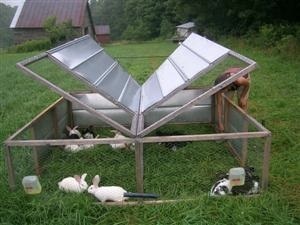 We’ll have the rabbits living above laying hens. The rabbit manure will fall through the floor of their enclosures and land on the floor of the building. There it will be mixed with carbonaceous materials. The chickens will scratch the manure and carbonaceous materials together to create a rich compost that we can then utilize in our gardens, orchards, and pastures. Earthworm farming (vermiculture) can also be integrated into this system using the waste feed from the rabbits to enrich the soil and, in turn, feeding the chickens. The chickens do their part creating the compost, laying eggs, and growing meat for the stock pot. Rabbits are easy to start with, and we may take a field trip to Swoope to see Polyface and inquire about purchasing some of Daniel’s line of meat rabbits. He has been breeding them for twenty years to increase their ability to utilize forage. Why reinvent the wheel ourselves when we can help him profit from his breeding program as well as give ourselves the best possible kick start to our own rabbitry?